From the factory, most vehicles come with halogen bulbs, which project in a yellowish light. By replacing your stock bulbs with LED bulbs, you can create a modern appearance with the cool white light of LEDs. 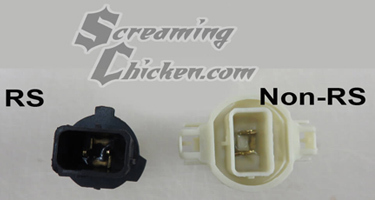 The installation is 100% plug-and-play, just replace your factory bulb! Fits 2010-13 Camaros with RS package or without (see picture below to determine what your car has ). Cars with RS lighting package will not work correctly without an adapter (see options). The adapter is plug and play (no wiring). Has a cool white output which makes for a great match for the factory halos and HID headlights on RS package cars. Uses Diode Dynamics bulbs which have an industry leading 3 year warranty. Great upgrade for $40 - car looks a lot better without yellowish lights.